I like that tradition....something to look forward to every year! Notice that it's his Dads loving arms saving him each time. We aren't BOTH mean parents. i was going to ask the same thing. what is with the santa dress/bathrobe. where was that santa and can i can get one those outfits? I'D BE SCARED OF THAT SANTA JEEEEZZZZ!!!! Or be tramatized for life. 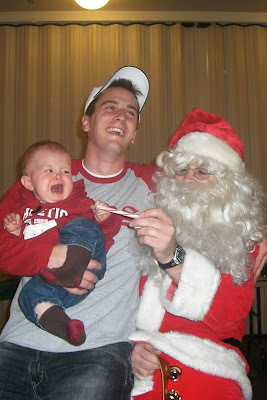 Does Santa think the candy cane is really going to help? 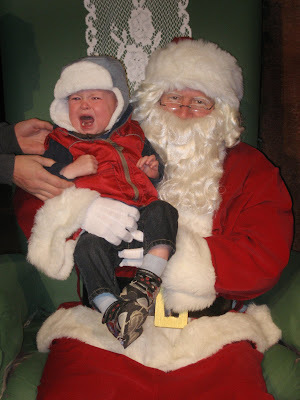 So, Ben was SO freaked about Santa for years. 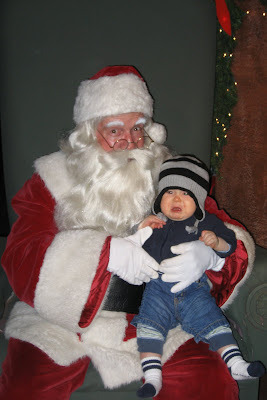 But Spencer didn't even flinch from Santa this year. No tears or anything. Weird. I think the freak out is more of the normal response though. Good for you for raising such a normal little dude! :) Little Zander is so dang cute. I can't get enough of him. After he can regain composure from the fetal position rocking back and forth for a few minutes first. LOL!! I love this so much. Don't worry about the fact that Zander will be in therapy the rest of his life...Can't wait to see next years!